If you’ve read some of our previous posts, you’ve probably noticed that several of us are avid audiobook listeners. In my case, it’s because I work with my hands a lot–sewing, knitting, and at my job making handmade wigs–so I need something to keep my brain busy at the same time. (The hands-free format, of course, also makes for ideal snacking-while-reading.) Not long ago, my co-worker Meredith and I discovered our new listening obsession: Kate Summerscale! 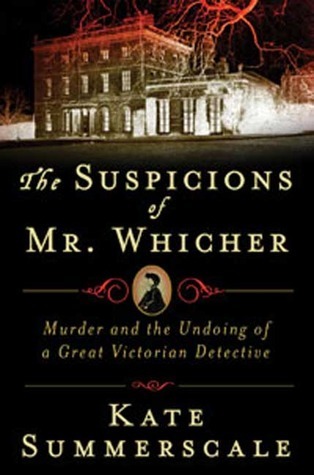 Our boss had just listened to her book The Suspicions of Mr. Whicher: Murder and the Undoing of a Great Victorian Detective, and couldn’t stop talking about it, so of course we had to find out what all the fuss was about. Kate Summerscale writes meticulously researched non-fiction books about history, mostly the 19th and early 20th centuries. Mr. Whicher is the story of the Road Hill House Murder–one of the most publicly scrutinized cases of the mid-19th century. Expertly entwined with the story of four-year-old Saville Kent’s brutal murder at his family’s home (reconstructed through court records, newspaper articles, and letters), is fascinating information about the history of detection, the Victorian attitude towards both the police force and the press, and the case’s influence in popular literature of the time. Mr. Whicher, the London detective called out to investigate the case after local efforts failed, was a figure of fascination to writers like Wilkie Collins and Charles Dickens. Detectives, after all, had only been around for a few decades. Think of the fascination that the detective process still holds for us today, and then imagine that the entire genre is brand new! Details of the case can be found popping up everywhere from Dickens’ Bleak House, to Mary Elizabeth Braddon’s sensational novel Lady Audley’s Secret. While backing up every detail with historical evidence, and only rarely straying into clearly-marked speculation, Summerscale still manages to keep the story engaging–never dry or dull. It takes true talent to be able to present every bit of documentation and evidence without sounding like Professor Binns. We were riveted the entire way through. I didn’t get a chance to take a gander at this book’s citation page, since we were listening, but I’d imagine it’s a doozy. If you’re a fan of history, true crime, or Victorian literature, I highly recommend giving this book a try. I’ve only ever been a sporadic reader of non-fiction, but this has me seeking out more by Kate Summerscale! While I certainly recommend this book in any form (it has also been made into a TV movie for ITV, followed by several other fictionalized tales about Mr. Whicher’s career), I have to give a plug for the audiobook. Mr. Whicher appears to have two different audio versions, an abridged version read by Harriet Walters, or the unabridged version read by Simon Vance. I can’t speak to the abridged version–it is more than three hours shorter than the unabridged, so I’d imagine you miss a lot of the tidbits of history that were some of my favorite parts. Simon Vance does a masterful job with the narration of the unabridged book. He has a deep, gravelly voice that brings to mind Christopher Lee, or Vincent Price–perfect for the chilling tale of a young boy’s murder. It’s no wonder he’s won a grand total of 75 awards for audiobook narration, including for his reading of The Complete Sherlock Holmes. I hope this inspires you to give The Suspicions of Mr. Whicher a try, even if you, like me, were dubious at the thought of listening to non-fiction. It was my first non-fiction audiobook, but it’s already not my last!